We officially moved into the Dollhouse. 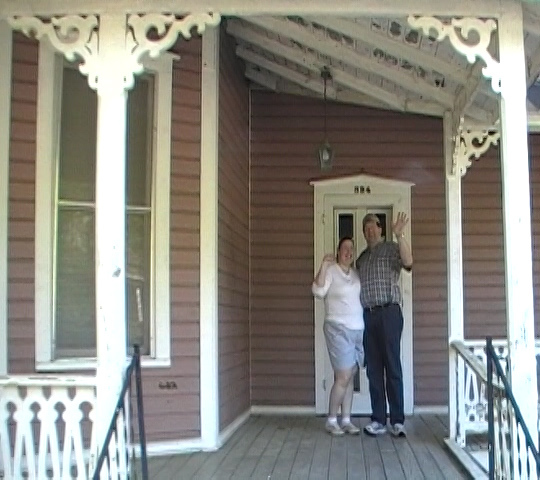 Not from moving day, but it’s the only pre-paint picture of us and the house that I seem to have! My day started at 6am, trying to get UHaul on the line to find out where the truck we “reserved” was going to actually be and getting nowhere quick. Penske saved our bacon, that day, and we made 3 round trips–the last one just Todd and I–before crashing late that night. We slept downstairs on sofas that first night, and for a few more afterwards as the upstairs a/c was just not able to keep up with the record high temps that first week, especially with the downstairs unit freezing over during the move. We spent the first several months showering downstairs because we couldn’t settle on a fixture for the upstairs bathroom until the end of October. On the one hand, it doesn’t feel like we’ve accomplished much this first year aside from unpacking (Todd’s office excluded, it’s still 80% in boxes). But really we’ve done a lot of living in this first year in the Dollhouse! We got the upstairs bathroom fully functional; installed a shed in the backyard for extra storage (because no, 2900 sq ft is obviously not enough);Â replaced a dishwasher, a microwave, and a washing machine; banished blinds in several rooms; lucked into a china hutch for the dining room; and have hosted friends and family for parties and holidays. And probably most of that stuff I still need to blog about (oops). And though we knew, going in, that the Dollhouse would be a long-term project and we weren’t in any sort of true hurry to start turning rooms over, I still thought we’d maybe manage to get one room updated (or at least started!) this first year, but we spent a lot more time in triage than expected. There wereÂ the roof issues to deal with, which led to the gutters, which led to Todd’s accident, which puts us firmly in a holding pattern, waiting to see what the finance dept will rule on Todd’s medical bills and how much of our savings will be therefore consumed. It’s certainly not the end of the world–far from it!–but it’s still a delay. During that delay we’ve had time to think, to mull, to consider some options. And we’re now faced with (should we have the funds available at all) the decision of what to actually do next (or first, as the case may be). The drain pipe leak (from the 2nd floor) that we (Todd) patched last year only got us about 6 months and is leaking again. Obviously this has to be fixed pronto, but the question is do we remove a small piece of the ceiling, enough to patch the crappy cast-iron connection that is failing and leave it at that, or do we commit to bringing down that ceiling and the damaged back wall (from ages of water damage the tenants didn’t report) and redo the back hall/butler’s pantry/mudroom area, that’s the question. It’s getting hot again (says Captain Obvious) and the upstairs is routinely 85+ degrees when we get home from work. We’re pretty sure insulating the attic would help with that (and the astronomical utility bills that are a result). Of course we also recently realized there might not be any vents on our roof to let the heat escape from the attic (hipped roof, so no gable to put a louvered vent in), and we’re thinking that an eave vent mightÂ be a less expensive option to start with. Or we could fence the backyard so we can get that dog we’ve been talking about for, oh, ever! (Not to mention gain some privacy and maybe a bit of noise break from the neighbors on each side. Oh, wait, there’s a catch to that plan–the shared driveway. And the best solution is escalating in that ‘if you give a mouse a cookie’ sort of way. Really it’s a no-brainer that we do one of the first two first. But part of me really wants to do a fun project, a pretty project, a project that’s not solely fixing something we didn’t break. Because a big part of me is afraid that if we don’t start doing some of the fun, pretty projects soon, we won’t ever do them. And we’ll wait so long that it won’t be worth it to get started and the Dollhouse will be in it’s current state for the duration. And while that’s not the worst thing ever–the house is perfectly livable the way it is–it’s not what we saw when we first looked at the Dollhouse 18 months ago. I don’t want to lose sight of that potential. Also, congrats on the anniversary! There will always be projects, and you guys have come a long way with the house already. Glad you took the time to reflect!